There’s still no resolution in sight. But some on the left see the new October departure date as a chance to counter the nativist right. Sometimes Brexit is so all-consuming that when Britain looks beyond, to the rest of the world, it is only to wonder how others view Brexit. So it has been in the past week, during which the European Union gave Britain another extension on its exit, since the country cannot get it together to leave. Conservative Prime Minister Theresa May has kept trying pointlessly to force through a withdrawal agreement that nobody wants—neither Leavers nor Remainers (she has met historic defeats, a vote of no confidence, and plots by her own party to depose her). Meanwhile, Parliament sat through a series of indicative votes to establish what Brexit option (including not doing it at all) there might be support for, but couldn’t come up with a majority for anything. This entire process is a shambles, with no end in sight: the fantasy of Brexit, which won by the tiniest of margins in a 2016 referendum, making contact with the reality of, well, reality. Would that international appraisal of this epic botch-up might cause a bit of self-reflection among Leavers in chief (they might wonder, just as an example, how they could countenance inflicting so much chaos and instability on a country they claim to love so much more than do Remainers). But no. Obviously not. The pain of seeing Britain’s exit timetable so overtly directed by the EU (oh the irony, given that Brexit was supposed to be about “taking back control”) is taken by arch-Brexiters as more evidence of humiliation, surrender, and betrayal—inflicted, variously, by the PM, Remainers, Parliament, judges, elites and, of course, the EU itself. This all fuels populist fire-starters, who have been jumping up a Great Betrayal narrative to boost hard-Brexit parties prepared to leave the UK without a deal. This includes UKIP, the original Brexit party, which has been moving further to the far right. And it is now joined by the new Brexit Party, headed by Nigel Farage, formerly of UKIP. While chauvinistic betrayal stories peddled by Brexiters are entirely predictable, it’s also worth paying attention to the changed minds of leading Leavers: In the past week, two prominent Brexiters have said it has all gone wrong and that they give up; we should stay in the EU. On confirming a Brexit extension period until the end of October (Halloween, to be precise; cue the inevitable jokes), Donald Tusk, president of the European Council, urged Britain, “Please do not waste this time.” And so Theresa May immediately announced that Parliament would break for the Easter holidays. But in truth that’s a good idea. For weeks now, MPs have been sitting late, with endless votes on the various bits of Brexit, trying to find a path through it. This isn’t just exhausting; it is damagingly stressful. 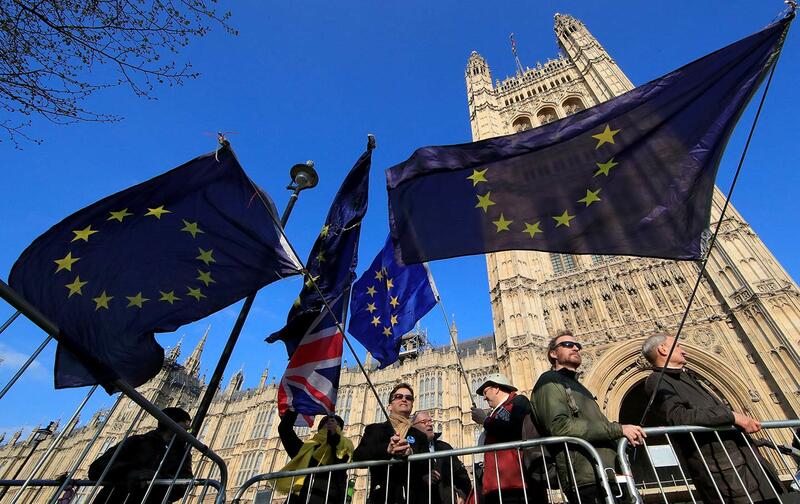 There are mounting concerns over the impact on the mental health of British politicians; “Brexit madness” is exerting a terrible toll, with reports of drastic weight loss, sleepless nights, constant anxiety, and MPs breaking down in tears. On top of which is the abuse and intimidation they are dealing with. Death threats are commonplace and, with an often menacing atmosphere from far-right pro-Leave demonstrators outside Parliament, MPs have been advised by police to travel in groups, while panic buttons are installed in homes. A joint parliamentary committee convened to investigate the issue has noted that what is publicly known about the scale of abuse represents only the tip of the iceberg. Labour is leading the European election polls, with the Conservatives predicted to take a hammering, not least because of their interminable divisions over Europe and May’s shambolic handling of Brexit. But with one in three Brits prepared to vote either for the far-right-infused UKIP or the new Brexit Party, many on the left see this as a proxy election—not just over EU membership itself, but as a chance to counter and cauterize the nativist right nascent across Europe, pushing back with progressive, pro-immigration, anti-racist values. Labour has not been great on this lately, with its leadership confirming the party wants to end Freedom of Movement and not exactly leading a pro-immigration conversation, presumably for fear of alienating Labour Leave voters. This is especially frustrating, given that public attitudes toward immigration have softened since the referendum—and the most cited reason for that shift is a more positive discussion in the years since, highlighting the contribution that migrants have made to the UK. The leadership is currently in Brexit talks with Theresa May’s team—after she finally realized she needed cross-party support for her deal. For now, this plays fine for Labour, because such engagement looks responsible and statesperson-like, but there are fears over the (improbable) idea of Corbyn facilitating Brexit, for which the party would take an electoral hit, and deservedly so. With her party in mutiny over these European elections, and some saying that they won’t even participate, May is pushing to avoid this scenario by getting her deal—you know, the one already defeated three times—through Parliament before May 23, when the voting take place. That’s the latest in a long list of self-defeating refusals to engage with reality. But still, the overarching reality is the one that presents the biggest problem. Because still, there is no way to leave the EU without damaging the UK; the only question is the degree of harm. Maybe the best way to use this extra Brexit time is for the leadership of at least one of Britain’s main political parties to start being honest about that.